EASY TO USE & FLEXIBLE SET-UP: Each piece of temporary movable border fencing can be easily interlocked with the ring on the side and folds flat for easy storage; no additional tools required to install this patio landscape edging fence: simply stick and secure the spiked feet of this decor no dig fence sections into ground. 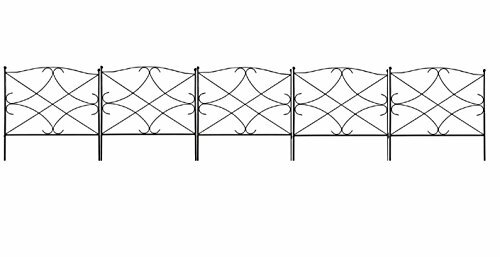 These no dig metal fence panels can be extended to different shapes according to your special uses of this path edging fence, one straight line, “L”, “O” or zigzag shape. If you have any questions about this product by Amagabeli, contact us by completing and submitting the form below. If you are looking for a specif part number, please include it with your message.